Kathleen O'Malley stood on the deck of the Barreth Lily and watched the land she'd called home for more than a dozen years slip from her view. She had thought she would be glad to see the last of it, but she was not. Emotions in turmoil, her whole being yearned to slip from the ship and return to what she knew. Even though Kathleen had not been happy with her situation, it was all she had ever known. 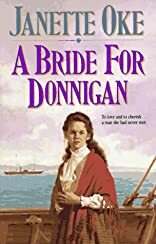 As the shoreline faded into the morning mist, her only certainty was that she was bound for America to marry a man whose name she did not even know and whose face she had never seen. On the other side of the Atlantic, Donnigan Harrison anxiously awaits Kathleen's arrival on a prairie farm far from her port of arrival in Boston. He has known the wonder of a dream fulfilled a snug frame cabin, the sturdy log barn and outbuildings, a fine herd of livestock, and crops in the field that made his eyes sparkle. Yet Donnigan felt a loneliness on the western frontier that pierced his very soul. With so limited opportunities for finding a wife, the notion of ordering a wife that once seemed unthinkable had come to make some sense. Now that the time has come, Donnigan feels like a small boy waiting for Christmas.